For the full details and developments on this feature, see bug 343251. It also seems like IE7 has a very similar solution. I’ve just opened my new photography web site, over at http://davidnaylor.org/photography/. Instead of grouping the photos into subject categories (which I did before), I have now made smaller galleries with only four photographs each, grouped in much more arbitrary ways. How on earth has this slipped by without me noticing? 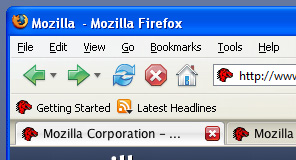 Firefox 2 is apparently getting a fairly serious visual polish (for beta 2). The whole browser interface will look more modern, and will fit in better with Windows Vista, as well as the other OSes. See more at the Firefox 2 wiki. Session restore. After a crash, Firefox will open the pages you had open before the crash. Undo Close Tab. Sits in the context menu (right-click menu) of the tab bar. However, there doesn’t seem to be any way of accessing this if there is only one tab open. Tab Overflow Scroll Buttons. If there are too many open tabs, scroll buttons appear at the left and right end of the tab bar. In the nightlies a few days ago, this feature was very annoying because the scroll buttons appeared if there were no more than about eight tabs. Now it has been adjusted – I can open 20 tabs without them appearing, which is a much better limit. More info at the Mozilla Dev Blog and at Mozilla Links.